This contains Action Items from all of your meetings at one place. You can search, sort and manage them here. Just click "Actions" link on the navigation bar. Your daily emails and slack notifications also link to this page. 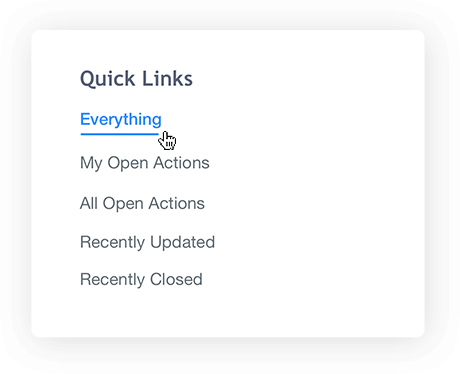 They provide a quick way to access action items you might be interested in. The filter on the left panel provides a quick way to search or sort the list of action items. You can search by meeting, assignee, status, tags and due date. You can sort using assignee, status, last modified or recently created. This is a standard list display. It shows all the selected action items in the right order. You can use this to update the status of action items. You can also sort this list by using assignee, meeting and status. You can add an action item during the meeting. Learn more about it from the Adding Action Items Guide . A meeting is incomplete without an action item. Add more action items in your next meeting to keep everyone accountable.